DJ Sullivan. 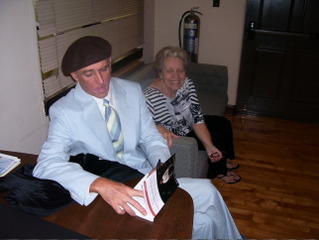 Here I am signing a copy of the book in which my play The Cake Women appears. DJ earned the book for a lifetime of service to acting, directing and teaching in San Diego. Also for teaching, directing and loving me for nearly 30 years. Thanks DJ! I love you! For the rest of you, purchase the thing here.